North Beach is an old Italian neighbourhood. There are tricoleri painted around the lamp posts and cafes named for operas, and delis filled with salami and prosciutto legs. Everywhere the smell of good coffee and soffritto gently frying, the clunk-shush of espresso machines, bouna seras and ci vediamos. I stayed on Mason at the San Remo Hotel, a pretty, Italianate Victorian with marble sinks, iron bedsteads and old wooden bureaux in the rooms. There were no televisions, duvets or phones, little of the modern world beyond a Wi-Fi connection. It was as if nothing had changed since it opened in 1906, since the two World Wars, since Kerouac slouched round the neighbourhood, seabag on shoulder, bottle in hand, looking for a bed, a sofa, a floor for the night. I had just started reading his novel, Big Sur, which opens with ‘Dulouz’ (Keroauc) stumbling drunk into City Lights bookstore to see the owner, his friend ‘Monsanto’ (Lawrence Ferlinghetti), and as I walked down Columbus and glanced in the window of a cheery old bookshop, I was startled to see the words “City Lights” in shaded gold letters on the glass. I had no idea it was still open. It has the shabby, shambolic air of all the best bookshops, a relief from the corporate monotony of the chain stores which dominate the market and have all the character of a bank. The icons whose names appear on the spines of the books in the Beat literature section which fills one wall, whose photographs decorate another wall, Kerouac and Cassady, Ginsberg and Corso, Snyder and Ferlinghetti, were drawn to San Francisco in the forties and fifties, when writers could afford to live in North Beach. They called themselves the Beat Generation. Allen Ginsberg (Carlo Marx in On the Road) and Gregory Corso each lived in apartments down the street on Montgomery. Corso broke into City Lights one drunken early morning and robbed the till. “We just didn’t pay his royalties for a couple of years,” shrugged Ferlinghetti. 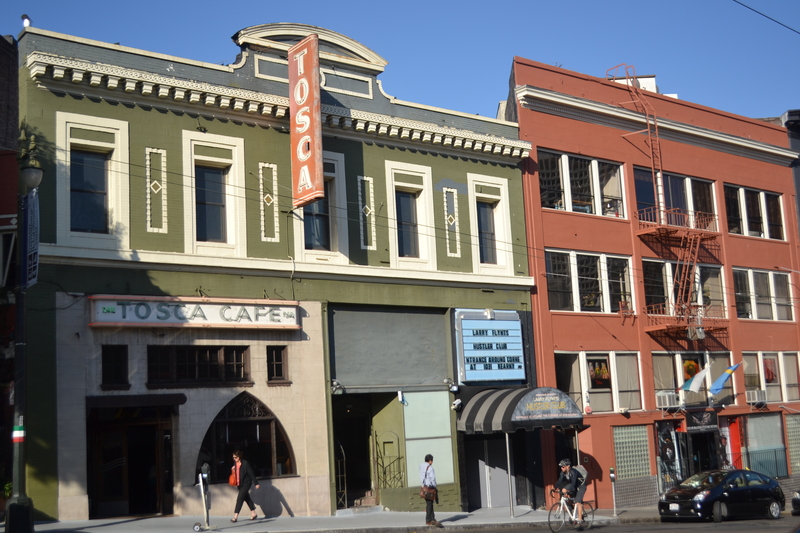 Neal Cassady (Dean Moriarty) lived – between wanderings and mistresses – with his second wife in nearby Russian Hill. Kerouac never really lived in his “favourite exciting city of San Francisco,” but frequently ended up there, hitching rides and hopping freights from the East Coast. He spent nights in friends’ spare rooms, or on their sofas, and stayed for a time in the attic of the Cassadys’ “two-storey crooked, rickety wooden cottage in the middle of tenements” which is still standing at 29 Russell Street. Otherwise he booked into Skid Row hotels around Third and Mission and Fourth and Howard South of Market, now developed out of recognition, and the Tenderloin, which is still the sorriest part of town. I passed through a few times, but always hurriedly and never at night. It makes you despair to see the ruined lives, the lack of hope, the long, desperate queues for soup kitchens, the derelicts in the doorways, the guys selling scraps of pitiful junk reclaimed from bins spread across blankets on the pavement – another, different, beat generation. “I ain’t no panhandler,” a man said to me, much as Brits say “I’m not being funny” whenever they are about to be funny. “No!” said his girlfriend, shaking her head in support, as he started to explain that he was from out of town, and his car had been towed, and he had no cash, and his card had been declined, and he was sorry to ask, but he needed to raise $18. I believed none of it, of course, but gave him a couple of dollars for effort. We all got together…and drove in several cars to Chinatown for a big fabulous dinner off the Chinese menu, with chopsticks, yelling conversation in the middle of the night in one of those free-swinging great Chinese restaurants of San Francisco. The building is still there with the sign out front, but it is closed, boarded up and graffitied now. Its neighbour, the “marvellous old restaurant” Sun Hung Heung (called Sam Heung in Desolation Angels) is now simply Chinatown Restaurant. 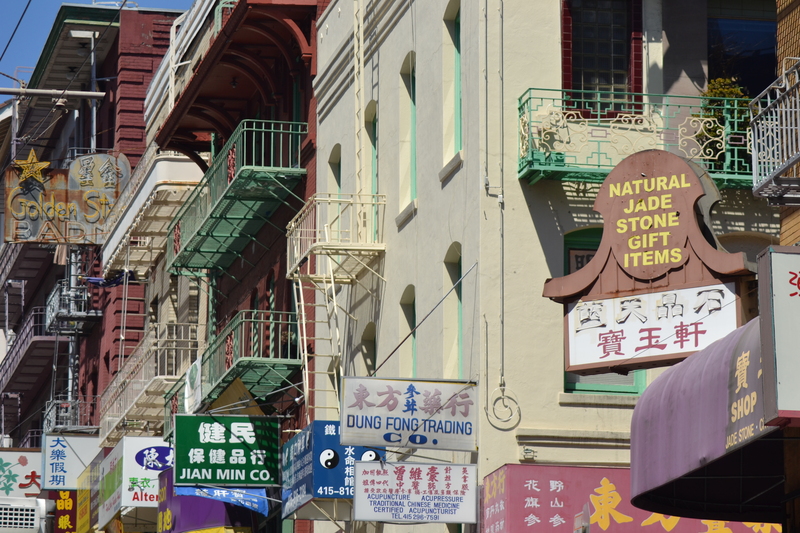 Ginsberg preferred the narrow red-brick, green-shuttered Sam Wo along the street at 813, with San Francisco’s most truculent waiter. It closed for good in 2012. Round the corner, up Chinatown’s steep main street is a dive bar which looks much the same as it did when Kerouac, Snyder and Ginsberg drank there in the fifties: like a cave with a Buddha and red leatherette stools. It is named Li Po, after an eighth century poet with a lifestyle like one of the Beats: a compulsive wanderer, a tough guy who killed men in sword fights, and a committed drinker, who wrote frankly about it in poems like “Waking from drunkenness on a spring day”. an arty bar…with colourful cartoon-like paintings….a quiet laid-back little bar where men played chess and guitar, and you could have a drink and conversion without having to yell over loud so-called music. It has barely changed – if it has changed at all – in sixty-five years. I expected Neal Cassady to explode through the door, back from the dead, telling three different stories at once. As I read the yellowing newspaper clippings pinned to the wall, a man of late middle age in a silk top hat and a leopard-print jacket rose from his seat and stared, as if I were the one oddly dressed. Perhaps to him I was. Caffè Trieste, up the hill on Vallejo, with its dark wood and brass, its old-fashioned juke box and smoke-yellowed ceiling claims to have been the first espresso bar on the West Coast. The Beats were regulars when it opened in 1956 (Ferlinghetti apparently still is) and what you see as you sit and sip your espresso is much as they would have seen it. Francis Ford Coppola is among the star cast of patrons whose black and white photos hang from the wall. He owns the verdigrised Sentinel Building which dominates the corner of Columbus and Kearny and appears in all the brochures. His American Zoetrope studio, based there – in a building which ‘Sal’ and ‘Dean’ and ‘Carlo Marx’ knew well – adapted On the Road for the screen. The Beat Generation was really just Kerouac, Ginsberg, William Burroughs and their friends. But after the Six Gallery poetry reading of 1955, which Ginsberg and Snyder closed out and Kerouac chronicled in The Dharma Bums, after Ginsberg’s Howl was published the following year and On the Road the year after that, North Beach started to flood with wannabes in sunglasses, berets and turtlenecks, with goatee beards, bongos and half-arsed Buddhist ideas. The media called them “beatniks”. 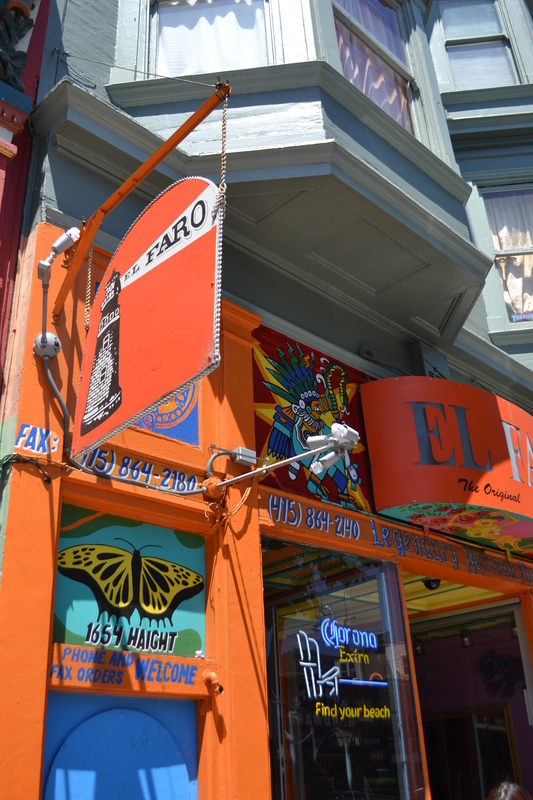 The next generation’s bohemians were priced out of North Beach and settled instead across town in the streets around the junction of Haight and Ashbury, where the media discovered them again and re-branded them “hippies”. The neighbourhood is stuck in the middle-sixties, like some ageing hippie, still high on the acid of half a century ago. Its stores and houses are a hallucination of orange and turquoise, magenta and blue, of peace signs and rainbows and trippy cartoons. 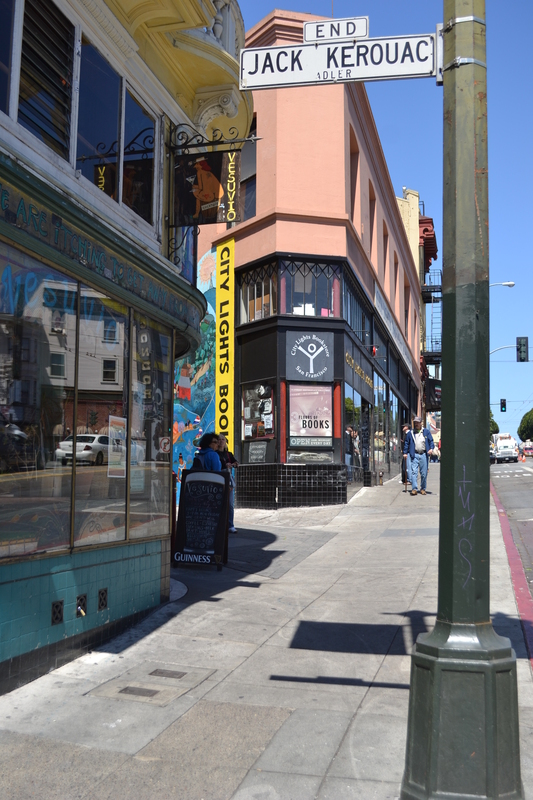 Tom Wolfe’s Electric Kool-Aid Acid Test is the Haight-Ashbury generation’s On the Road. It follows another hedonistic journey from coast to coast, fifteen years after ‘Sal’ and ‘Dean’s’, when the Beat Generation was middle-aged, and LSD was the favoured drug instead of Benzedrine and booze, and the soundtrack was acid rock, not jazz. But Neal Cassady was still doing the driving; he partied with the hippies as he had with the Beats, bounded from one generation to the next. Ginsberg, too, found a place for himself in the sixties. He became friends with Dylan and Timothy Leary and protested the Vietnam War. But Kerouac slid into a bitter, reactionary middle age; no longer travelling, hardly ever sober. From the joie de vivre of On the Road to the despair of Big Sur, and worse. He died, at 47, just twelve years after his best-known book was published. But Cassady had been dead 18 months by then, living fast to the very end. A trip to Mexico, a party, a few drinks, a fistful of Seconal tablets, a late-night walk along the railway line. He was found in the morning in a coma from which he never recovered. He was 41.